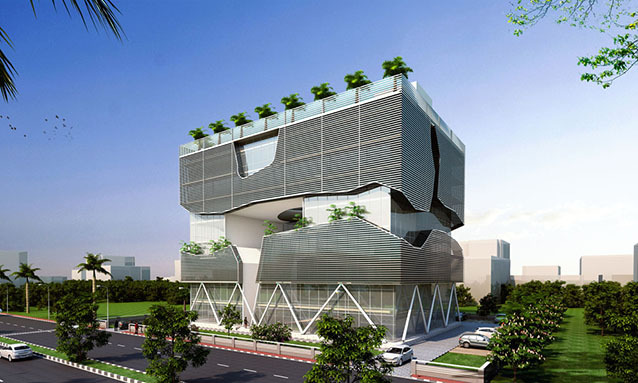 The corporate headquarters designed by Annkit kummar of the Lucknow Industrial Development Authority (LIDA) is planned keeping in mind the principles of integrating nature in architecture. Such a unison would promote sustainable architecture principles in planning of industrial buildings in future, which otherwise are flavorless and solid in their appearance. The proposed Headquarters of LIDA assimilates greenery into the building at higher levels providing terrace gardens and recreational space to the employees. The central courtyard together with the vertical voids aid in the wind flow through-out the building keeping the entire building mass cooler during the summers. The 2 voids on the façade and the central courtyard provide a prevalent cross breeze throughout the central atrium keeping the building temperature inside lower as compared to the heat outside. The wind flow in the building is through the front and side vertical voids moving in the direction of central court. The cross breeze created creates a micro climate on the inside which is cooler comparable to outside. 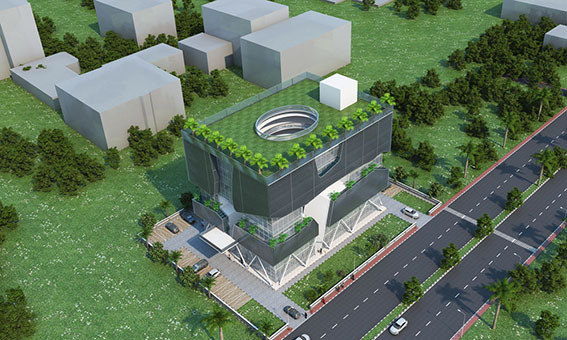 The entire solid mass of the proposed headquarter is covered with horizontal louvers to create bio-climate on the inside which is cooler than outside. The prevalent heat conditions in Lucknow require intelligent façade features to keep the building cooler. The glazing used through-out the façade would be solar glass which would prevent heat from going in thereby keeping the balance of temperature.